WASHINGTON (CNN) -- Can you "graph the solution set of a linear inequality in two variables on the coordinate plane?" State governors came together earlier this year to come up with a set of national education standards. Or can you use historical context to interpret Walt Whitman's poem "O Captain! My Captain!" which he wrote in his grief over the assassination of Abraham Lincoln? If not, be glad you aren't in high school. The examples are among the mathematics and English questions in standards recommendations that state school chiefs and education experts are currently considering, as they try to come up with core guidelines for students across the United States. The goal is to have all graduates be college and career ready. The United States doesn't have federal education standards; each state sets its own. But earlier this year, state governors decided to come up with national standards. "If you cross the border from one state to another your expectations change," said Gene Wilhoit of the Council of Chief State School Officers. "What we've set our minds on is creating a common set of standards across all the states that are higher, clearer, fewer. And a common set of standards that are internationally benchmarked to what the best countries in the world are doing." 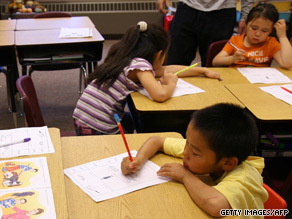 Are states following stimulus plan for schools? Some people don't think the math recommendations are tough enough. "I think some people who are in mathematics, teaching mathematics in college or are in mathematics professions have a much higher expectation of what those standards would be than someone who is going to go into college in another field ... law, social sciences and so forth," Wilhoit said in an interview Monday. For the English language standards, Wilhoit said, the plan isn't to hand out a list of recommended reading, but to let the states make their own choices of literary works, with an eye toward certain criteria. For example, in the "O Captain! My Captain!" illustration, students would also be given a New York Times article from the time of Lincoln's death. The goal is to create a problem for which students would use historical context along with reading skills to interpret a text. The states could switch out the readings as long as their exercises met that goal. The recommendations for the reading portion could also include reading a business memo or a statement from the Federal Reserve Bank. The overall goal is to have students who are able to read complex technical documents as well as poetry and prose. After the public comment period closes, officials will review the replies they have received and make changes. Once they come up with the final recommendations, a validation committee made up of experts in the education field will look over the standards and give their final approval by the end of January 2010. The standards will take several years to implement, because each state can adopt and enact them at their own pace. But education officials in Alaska and Texas say they will wait to review the published core guidelines before deciding whether they will adopt them. In a written statement on its position, the Alaska Department of Education says that its state "already has detailed standards for student performance in reading, writing and math for each grade from three to 10. We have spent considerable time and money developing assessments that measure these standards." Texas Education Agency spokeswoman DeEtta Culbertson says her state is already in the midst of a multi-year program to adopt new, more rigorous curriculum standards. "Because so many of the standards have already been adopted, and we are in the process of adopting new textbooks, it would cost us 2 to $3 billion to completely revise again," she said. But the Texas school commissioner said the state will look at the new national standards when they come out. According to Culbertson, "If they are more rigorous than ours, we will adjust ours to be even more rigorous."